The Swannanoa Community Yard Sale is back! This very popular event is sponsored by Friends and Neighbors of Swannanoa (FANS) and takes place twice each year, in the spring and fall. Mark your calendar for Saturday, October 7, and come on out to the Ingles parking lot to hawk your wares or shop for treasures (or maybe both). The sale will run from 8 a.m. – 1 p.m. (rain or shine). 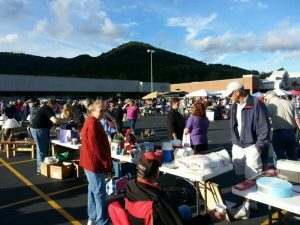 FANS would like to thank Ingles for allowing us to hold the community yard sale in their parking lot – one of Swannanoa’s highest-visibility locations! Seller spaces (approx. 10′ x 10′; bring your own tables) are $10 each. Registration now open. To reserve a spot (or two or three! ), send an email to SwannanoaYardSale@gmail.com or call 828-581-9707. Payment for seller spaces will be made on the morning of the sale, in cash only, as part of the registration process. Please give 24-hour notice if you must cancel your reservation, so that your spot can be given to another seller on the waiting list. Seller spaces usually sell out in advance, so make your reservation early.